Offering you a complete choice of products which include inertia pouring frame. Inertia Pouring Frame has been developed for use with machines which produced a high level of Vibration or those which are subjected to external forces or are simply unstable when mounted directly on high deflection/low stiffness helical spring or rubber Mountings for giving an extremely high degree of vibration isolation without excessive motion. 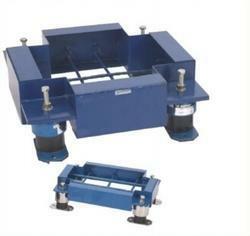 Vibration attenuation is dependent on base rigidity as well as Isolator deflection. If the base becomes distorted because of weight distribution, belt pull or the torque introduced by a direct drive, the equipment will wear out more quickly and vibrate excessively because of the loss of the alignment. Base resonance is another difficulty that can result from poor frame construction, If base members are light and long, they will tend to Resonate at low frequencies that may be sympathetic or close to the operating speeds of the mounted equipment. The Frame is of fully welded construction with reinforcing bars and can be straight away filled at site with concrete to become rigid floating concrete platform. The inertia weight of the concrete will also reduce the operating amplitude of equipment. Viscous Damper can be incorporated to further control motion during transient conditions such as machine run-down and machine faults. Height saving brackets can be used to further lower the Centre of Gravity for better stability. Looking for “Inertia Pouring Frame”?